Friday December 11th 1925 I was busy at home all day. Did some washing for myself and ironing and mending for Ott. We had our suppers before we went for her. To picture show later. Saturday December 12th 1925 It is seven years since in the fog and rain we took Will away from the old home. How desolate I felt and twenty-seven since in the bitter cold we took Edith away. I put in part of this forenoon doing things about the house. Read Iowa City papers in afternoon. Wrote Hattie and Lizzie Lindley. Sunday December 13th 1925 The Seiberts friend came out to help Maime do some things. Ott busy with the work. Soon after dinner we started to Emilys. Did not get home till 9.30. Monday December 14th 1925 Did not get up till late. Wrote Warner McCall in AM. After dinner did some sewing for Ott and wrote to Ella Byers and Mrs Fern Patterson. Beautiful day. 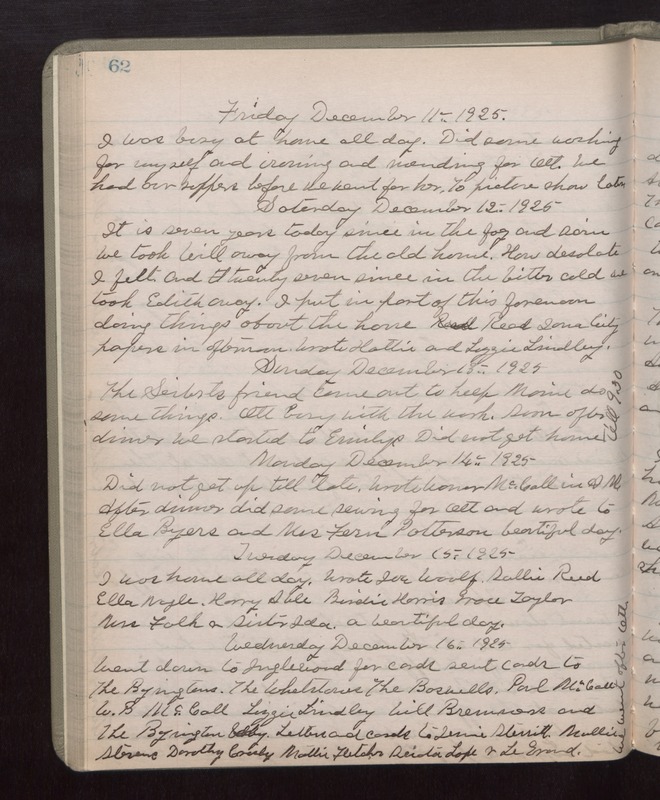 Tuesday December 15th 1925 I was home all day. Wrote Joe Woolf, Sallie Reed, Ella Nagle, Harry Able. Birdie Harris, Grace Taylor, Mrs Falk & Sister Ida. A beautiful day. Wednesday December 16th 1925 Went down to Inglewood for cards. Sent cards to The Byingtons, The Whetstones, The Boswells, Paul McCall, W B McCall, Lizzie Lindley, Will Bremners and The Byington baby. Letters and cards to Jennie Sterritt, Mollie Stevens, Dorothy Crosby, Mattie Fletcher, Sciota Lape & LeGrand.